Your home is your safe haven, and you want to keep it that way. A family-owned Durham business in operation since 1955, Gerald Jones Company understands the importance of preserving all that is important to you. Choosing a security door from Gerald Jones Company is an excellent way to assure the continued security of yourself, your family, your home and your possessions. Why Choose a Home Security Door? 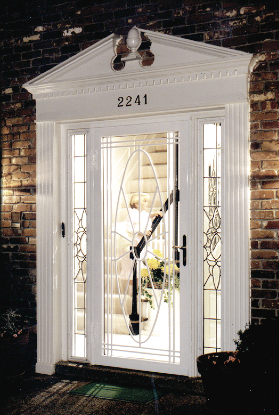 Openwork steel security door- Looks similar to a decorative wrought iron door, featuring a tempered glass panel. Steel entry security door- Gives the illusion of being a standard wooden or fiberglass door, but is actually made of steel. Proper installation of a steel security door is just as important as selecting a quality security door. The skilled and experienced security door installation specialists at Gerald Jones Company will make sure your door is supported by a strong door frame and installed correctly for maximum security. To learn more about the security doors we install, view our Security Door Brochure and our video demonstration of just how secure these doors are. When you’re ready to preserve your peace of mind with a steel security door for your Raleigh-area home, get in touch with the experts at Gerald Jones Company. We are committed to the best service, home improvement products, and ultimately, the well-being and safety of our customers. Call us today or fill out the contact form to the right to talk about security door installation for your home! Gerald Jones Company is proud to serve homeowners in Cary, Apex, Morrisville, Raleigh, North Raleigh, Durham, Hillsborough, Carrboro, Chapel Hill, Butner, Mebane, Roxboro, Creedmoor and surrounding areas of NC.